�When you�re the CEO of a large organization � or even a small one � your greatest responsibility is to recognize whether it requires a major change in direction. Indeed, no bold new course of action can be launched without your say-so. Yet your power and privilege leave you insulated � perhaps more than anyone else in the company � from information that might challenge your assumptions and allow you to perceive a looming threat or opportunity. Ironically, to do what your exalted position demands, you must in some way escape your exalted position.� � excerpt from Bursting the CEO Bubble, Hal Gregersen. Harvard Business Review, March � April 2017. This passage stuck a chord with me and I couldn�t agree more wholeheartedly. The majority of feedback given in organisations tends to flow in a downward direction; people in higher levels of an organisation are giving feedback to people in lower levels. People may be asked to provide feedback in the opposite direction � back to their superiors � but it is rarely given freely and without careful consideration. I believe many people don�t give feedback to their superiors out of an instinct of fear. That is not to say they are scared of their managers, but more that there is a sense of uncertainly around how their feedback will be taken and any resulting consequences. The safer option tends to be to bite one�s tongue and keep quiet. The impact of this behaviour is that people (or groups of people) can feel stressed or excluded, and ultimately become disengaged. I also believe that many managers / CEOs don�t ask for feedback from lower levels of their organisation because their information �feeds� are so broad in our modern era. CEOs have so many sources of information to consult and deal with that they are spending more and more of their time in a scanning mode rather than a deep analysis mode. Consequently, as their decision-making time is continually reduced they have to use their bias to make quicker decisions. Important decisions in any organisation deserve careful consideration. Bias tends to work as an opposing force to this process. As the excerpt above suggests, and that I strongly agree with, our CEOs (and managers) must expand on their process of discovery. They must create more opportunity to be open with the levels of the organisation below them and consistently request feedback, particularly on their own performance. Not only will staff feel listened to and more engaged, but also this process will invite alternative perspectives � alternative ideas, alternative ways of thinking, and alternative cultural outlooks. It is this diversity of thought � the diversity of their entire organisation - that should be informing our CEOs decision making process. Newsletter Reader Question: We received the following question from one our readers � Where do you find the balance between theory and practice sits in terms of your content as a consultant and delivering on client outcomes? I attended the 75th Academy of Management conference a couple of years ago in Vancouver. This event attracts 10,000+ academics and is the premier management conference for academics in the world. There were very few practitioners who attended this conference. I consider myself a scholar practitioner. I love the theoretical aspects, and as I am a consultant, I tend to look at how do we apply theory into practice. One of my favourite quotes is, "Theory without practice is empty and practice without theory is blind." This quote actually played an important part in helping me decide to go back to school and further my studies some 20 years ago. One of the things that struck me at the conference was the number of discussions in which we were discussing various aspects of theory. I kept bringing the discussion back to the point that those topics are not very relevant to my clients. My clients are looking for information that they can apply to help them be more successful. My clients want things that make practical sense, that are easy to understand and explain, and that can be applied to the real world. My clients are not after the academic references. I always find that I'm constantly caught in this dilemma around how do we bridge theory and practice. The term sometimes used is "praxis�, which is the connection between theory and practice, and how do we as practitioners bring that to make more sense in the business world. One of the points I argue is that I find there are many people who are extremely knowledgeable when it comes to aspects of culture. They may know lots of different things about different countries, different etiquette, rules, etc. However, the ability to translate that knowledge into action is where these people often fall over. If you are simply living in the world of academia and you don't need to put theory into practice, this is not a hugely significant problem. I would argue, though, that regardless of whether you work internationally or domestically, you are dealing with people of different cultures. Therefore, cultural intelligence as a concept, and a construct, is not just important from a theoretical perspective, but also important from a practical perspective. I firmly believe we need to shift all theories into practical, real world action. In his raw and honest book, Mark Manson takes the ideas of �positivity�, �positive thinking� and the �let�s-all-feel-good� mindset and kicks them to the curb. Manson posits that human beings are flawed and limited - �not everybody can be extraordinary, there are winners and losers in society, and some of it is not fair or your fault.� He argues that we must each get to know our own limitations and accept them. In plain language, there are only so many things we can give a f*ck about so we need to figure out which ones really matter. Manson runs a wildly popular Internet blog in which he doesn't sugar coat or equivocate. He has bought this same format to his wildly popular book in the form of well-timed, profane humour and bracing insights. The argument he makes is also backed up by academic research and entertaining stories. 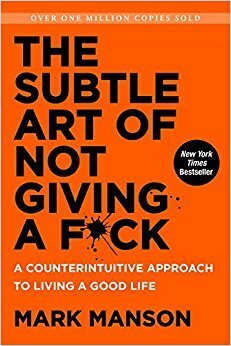 This �real-talk� bestseller is a refreshing take on the traditional self-help guide to finding satisfaction and grounding in our lives.